The Soldier’s Song is a simple installation taking the form of a walk-in karaoke booth that invites an audience member to duet with a currently serving soldier. Quarantine’s Renny O’ Shea developed The Soldier’s Song with members of the Band of the Kings Division, based at Weeton, near Preston, alongside soldiers from Lancashire, the North West and Birmingham. Since the installation made its first appearance in a disused shop in Lancaster, it has been seen in Manchester Art Gallery; Barbican, London; on a railway platform in Birmingham, and an empty shipping container in a park in Groningen, Netherlands, among other venues across the UK. This forms part of the Preston Remembers events being run by The Harris. Quarantine’s remarkable work has an international reputation for confronting the here and now - high art and the everyday collide. 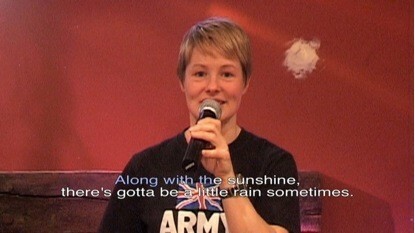 In this 10th anniversary year of the Gulf War, in which some of the soldiers from the region featured in the installation served, The Soldier’s Song provides a link to a soldier’s world and asks us to consider our connection with someone who might fight in our name. The Soldier’s Song is presented and produced by Live at LICA (Lancaster Institute for the Contemporary Arts) with funding from Lancashire County Council. The regional tour of The Soldier’s Song is part of a larger Live at LICA scheme that enables a body of innovative performance works to reach new audiences within Lancashire.